A whole blog could be created on the psychology behind some of the world’s greatest directors. These people work their entire lives to interpret and depict stories through the medium of film, by showing us worlds populated by vivid, extraordinary characters that they themselves have created in their minds. This is in actual fact a good definition of an auteur, from the French meaning author. The auteur theory came into being in 1954, a definition formed by French director and critic Francois Truffaut as a “reaction against the bloated “Tradition of Quality” cinema” (The Alfred Hitchcock trust: Francois Truffaut) An auteur is a director whose film, or films, reflect their own personal artistic vision through the use of unique style and recurring themes. What exactly is that one quality that makes a certain auteur’s films instantly recognisable? Alfred Hitchcock could very well be classified as an auteur. His work continuously expressed significant representations of his creative control. Even though most of his work was made during a period when mostly all American studio movies were more the “product of a studio or a production company” (Phillips, 2005, p. 506) his films show an individualistic style and art form that is instantly recognisable as Hitchcockian. The first example of this is quite possibly one of Hitchcock’s most famous films, “Psycho”. This film is a prime example of a typical Hitchcock theme that is present in mostly all of his films, and is the first example of his auteur nature – namely his somewhat indecisive view towards, and obsession with, women. “Psycho” contains two significant primary female characters – one of them is killed off after 47 minutes – the other is already dead. Hitchcock had a somewhat love/hate relationship with women. There are many stories relating to his suffering the Oedipus complex, a somewhat strong and inappropriate obsession with his mother. The inclusion of a mother figure in several of his films all point towards a troubled relationship with his own maternal figure, “Generally, mothers are powerful characters in Hitchcock’s films” (The Psychology of Alfred Hitchcock. 2006) and in “Psycho” the main point of the story is the main character’s deep love for his own mother. The other female character is another recurring theme – a beautiful girl. It was an unwritten rule in Hollywood that all of his actresses had to be beautiful and were aptly abrupt at declining Hitchcock’s advancements. Andrew Sarris (“The American Cinema“) studied the work of Alfred Hitchcock very closely and he himself states, “His vision of life is more Freudian than Jungian.” (Andrew Sarris, 1979, p. 46). 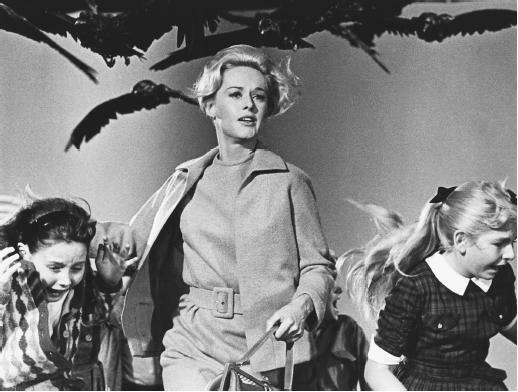 One of Alfred Hitchcock’s biggest obsessions came in the form of Tippi Hedren in our second example, “The Birds”. Yet again another beautiful femme fatale thrown into a terrifying situation. However it is this another recurring theme that is in many critic’s opinion the epitome of a Hitchcock film- namely – putting completely ordinary people in extraordinary situations. More notably films such as “The Man Who Knew Too Much” and “North By Northwest” give further examples of this theme, and ones which help create this overall image of what makes a film Hitchcockian. However when discussing “The Birds“, we want to focus on two auteur theory criteria and those are a distinct style and technical competence. Hitchcock had a style of filming that started when he began making films in England. His earlier films such as the “The Lady Vanishes” show the beginnings of a style that has become synonymous with the Master of Suspense. He took risks with camera angles and chose what to show and what not to show the audience in very unique ways. He uses shadow very expressively and makes it another character. The use of the shadows of the crows in this example, hiding the actual bird and only showing the shadow, heightens the huge sense of mystery. Technically Hitchcock proved in “Vertigo” that he was technically savvy enough to produce unique filming styles and camera angles that give him a technical signature. He alone is the man who put the dolly zoom on the map. 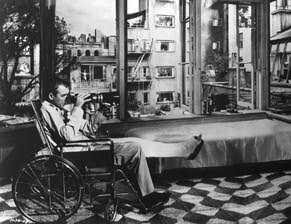 In one of his most recognisable and beloved films, “Rear Window“, the auteur delivers a film that is so full of his little touches that it just screams HITCHCOCK, and yet quite a lot of modern audiences have never even heard of the film. Beautiful leading lady – check. Portagonist put in an extraordinary situation – check. Unique filming style – check. This example gives us everything. Alfred Hitchcock loved putting his male characters in situations that he himself would love to be put in. This film revolves around a photographer who is crippled and stuck at home, with only his neighbours as a source of entertainment and voyeuristic intrigue. Once again, not only does Hitchcock deliver a struggle with the extraordinary, but the film is “filmed in a way you’ve never seen before” (taken from the Trailer narration). Placing the audience in the apartment with the trapped photographer and never leaving there, puts the viewer directly into the situation. Never does the film camera leave that apartment and the only view the audience is given is of inside the apartment or looking out the window over the neighbour’s apartment. This is a very special technique that was a huge risk but worked perfectly. This technique gives this last example a very special feel to it and one that is a classic Hitchockian feeling, a sense of entrapment in the unexpected. Category : Essay, Random, Review!